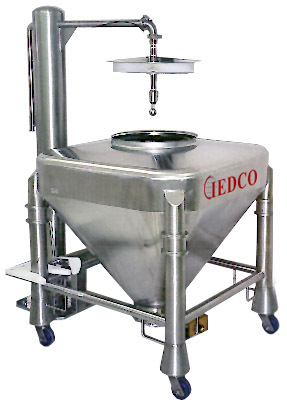 IEDCO offers a complete line of traditional “butterfly valve” type IBC Containers as well as IBCs that can have their contents transferred via a pneumatic conveyor. While we have based our standard designs around the use of a nominal 46” square footprint, our IBC Containers are custom designed to fit our client’s project specific requirements. They are available in 17.5 cubic foot increments (.5 cubic meters or 500 liters) up to 105 cubic feet (3 cubic meters or 3000 liters). Our IBC Containers can be fabricated from a variety of materials, including: carbon steel, stainless steel, Hastelloy, or virtually any exotic alloy that might be demanded by the chemical being handled. Standard configurations are available in polyethylene and custom molds can be built to meet different requirements. Our standard designs transition to a 10" diameter tri-clamp outlet and are typically configured with a Butterfly Valve. However, they can be fit with any kind of valve which might be more suitable, such as an iris valve, slide gate valve, or membrane valve. 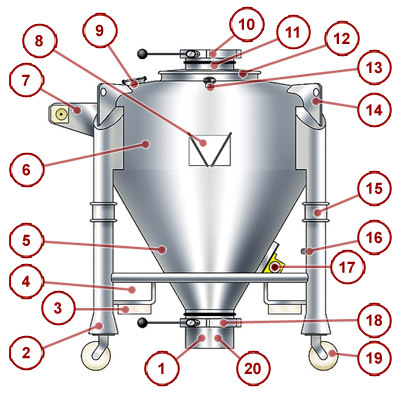 This type of IBC Container is usually used where the product can be "choke fed" into the process without rate control and the materials being handled are fairly free flowing allowing complete discharge without mechanical assistance. Discharge Stations are available for the IBC Containers and allow for proper location of the IBC, as well as containment, during the discharge operation. A variety of different control options are available to suit the application. Discharge stations can be built on weigh frames or platform scales which, when married with the appropriate weigh instrument, can provide a gravimetrically controlled discharge from the IBC Container. Every IBC eventually needs to be cleaned. We will build an IBC wash station to clean the internal surfaces of the IBC Container. 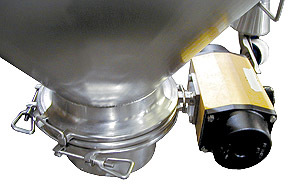 An IBC Container is pushed into a locator frame and manually locked in place using a simple swing latch on the frame. 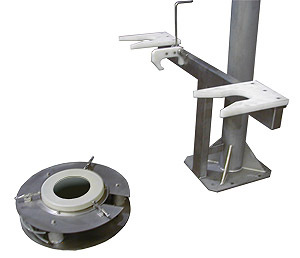 The frame is mounted on a pneumatic lift supporting a "dummy lid" with an inflatable seal. The lid is fit with a spray ball wash nozzle that typically has a flow rate of 12 gpm with a working pressure of 60 psi. The cleaning operation can be a simple, manually operated, plain water system or an automated CIP system.